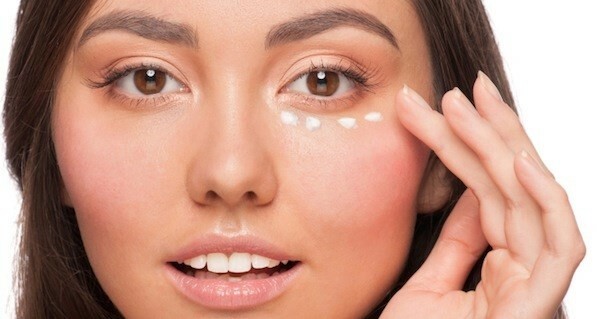 Do You Know How To Treat Your Under Eyes? The skin below your eyes has its own set of skin care “rules.” It’s uncommonly sensitive, thin, and, for better or worse, is often a window into your overall vitality for others to see. Have you had someone say to you “Are you okay? You look tired today,” just because the skin under your eyes is a little puffy or the under-eye circles are darker than normal for some reason? The eyes and eye region show it all. Understanding how to care for the skin under your eyes is important for many reasons, but especially because it is one of the first things you see when you meet a person. It’s also important to prevent this delicate, sensitive skin from becoming damaged from poor quality skin care products, improper practices, or unprotected sun exposure. The particular properties of under-eye skin require differences in products and product application techniques. We want to help you understand the unique aspects of the skin around your eyes and provide basic guidelines so that you can take good care of this important area of your face. Why is the Skin Under Your Eyes Different From the Rest of Your Body? The eyes are important sensory organs- they provide us with the gift of sight. So biologically, the design of the body accommodates the protection and requirements for essential organs. For this reason, the skin surrounding your eye is much more photosensitive and environmentally sensitive compared to the skin on other parts of the body due to its proximity to an area designed to collect light. In addition, the skin under your eyes is thinner to provide room to cover tiny fat pads that cushion and protect your delicate eyeballs from trauma or injury. The lower eyelid skin is not as mobile as our upper eyelids, and therefore, the underlying muscles are generally not as thick and developed in your lower eyelids. The skin on the rest of your body is substantially thicker than the skin around your eyes. Thicker skin is means that it’s more resistant to harsh chemicals, weather, and the sun’s UV rays. Therefore, your much thinner eyelid skin is often the first spot to notice allergic reactions or irritation from skin care product ingredients or other types of dermatitides. It also wrinkles faster from sun damage than anywhere else on your body. In contrast, have you noticed that your skin is thickest in bodily areas where the most contact and use occurs (hands, feet, elbows, etc.)? The body has adapted that skin to be able to stand up to more force and trauma. In direct contrast, the skin around your eyes lacks mobility, is thin, and has the underlying protective fat pad behind your lower lids, which results in a unique type of skin that requires different care than the skin covering the rest of your body. What Problems Arise Due to the Unique Nature of Under Eye Skin? Because the skin under your eyes is so thin, it is more susceptible to overall issues occurring in the body. Dehydrated, sleep deprivation, fighting an illness, etc., can often be conveyed as dark circles or puffiness in the skin under your eye. The blood vessels that supply oxygen and nutrients are much smaller in thin skin, so if you are dehydrated or not well (like lacking sleep, ill, etc. ), the thinnest parts of your skin will start to show it first. It is essential to remain hydrated, have good sleep and hygiene, as well as general health to nourish your skin so that being “under the weather” doesn’t show in your under-eye skin. The under-eye skin is also one of the first areas of your skin to show the signs of aging. Thin skin loses its elasticity and collagen faster than thicker skin. Additionally, the fat deposits underneath your eyes start to shrink, creating a puffy and “sunken eye” look. This is why it’s important to protect this skin from sun damage and prevent thinning. It’s highly recommended to use eye products or in-office eye treatments to boost the strength of your skin and promote collagen growth to retain the structural integrity. Lastly, the location and nature of the under-eye skin makes it very sensitive. It will be easily irritated by harsh cleansers, anti-aging creams, and makeup. It is always important to read the labels of each product to determine if it is safe for application around the eyes- in most cases, it is not. Skin care manufactures develop eye products specifically designed to treat and care for under-eye skin for this reason. It is virtually impossible to create a beauty product that can effectively treat all the different skin types of your face, including your under eyes. The skin and collagen under your eyes are structured differently, and need special formulated products to cater towards their health. 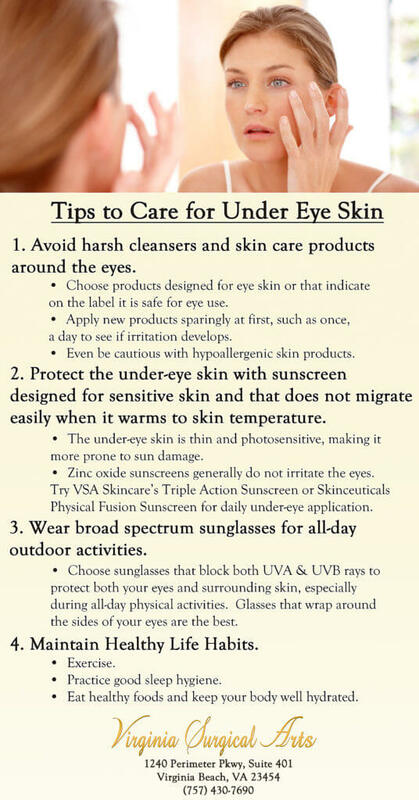 If you have any questions on how to care for your under-eye skin, let us know by calling our office at (757) 430-7690.